database, or tool that is introduced. Managing the SAP portion of your IT infrastructure has become a major challenge for many IT groups. SAP users struggle with manual interactions and custom scripts when trying to integrate SAP applications with other applications in their enterprise. Join Ralf Paschen, Sr. Product Manager at UC4, as he discuss how UC4’s One Automation for SAP solutions provides process-oriented integration of all SAP and non-SAP applications throughout the enterprise. Scale your business operations without adding additional staff. - How to run multiple SAP instances and processes in sequence and in parallel, reducing job execution times. - Increase measurable ROI for all mass data processes by up to 80%. Ellucian's Banner Higher Education applications are helpful for aligning IT operations with your academic institutions’ requirements, but they can also create major challenges for your IT staff, including manual interventions for report generation, financial aid processing, and lack of visibility across your IT environment. Join John Sundet, Sr. Systems Analyst/Programmer at College of St. Benedict /St. John's University and Matt Busch , UC4 Sr. Product Manager; as they discuss how a unified automation platform can turn manual cross-functional Banner activities, into well-orchestrated, automated and predictable process. If your community-based financial institution is like most, your daily business batch cycle in DNA consists of manually entering 30, 40, 50, or more jobs that must be run in the correct sequence. This process is inefficient, time consuming, and susceptible to errors. Join Eric Gauthier, Senior IT Systems Administrator at BECU, and Mark Romeo, UC4 Sales Engineer, as they discuss how a single unified automation solution can integrate existing applications and automate financial processes. 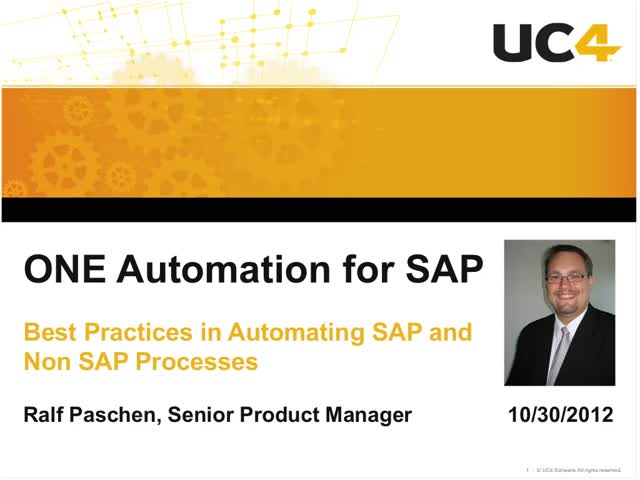 Join Scott Rohrbach, Deployment and Automation Engineer at Air Products and Chemicals, and Ralf Paschen, Senior Product Manager at UC4, to discover how Air Products and Chemicals optimized their SAP System Copy processes, to achieve 100% automated weekly system copy. As a retailer, you depend on Oracle’s sophisticated retail solution to ensure a continuous stream of revenue and good customer service. However, implementing it can be time-consuming, requiring several months or more. As an added bonus all attendees will receive the complementary white paper “Optimize Performance, Reduce TCO for Oracle Retail”. In under 5-minutes we'll walk you through the steps it takes to complete a totally automatic SAP system copy, with no pre- and post-processing to chew up time and money, and no needless mistakes.